Do you know where most of your customers come from, why they visit or what makes them buy? Knowing the answers to questions like these will help your business go from strength to strength. Website analysis can turns a good site into one that's performing at its peak and help send your sales figures skywards. We'll provide regular reports in plain English that get right under the skin of your business. Our website statistics will monitor the practical things like website speed but it will also drive website optimisation and whenever you need help interpreting the results, we're here at the end of the phone. 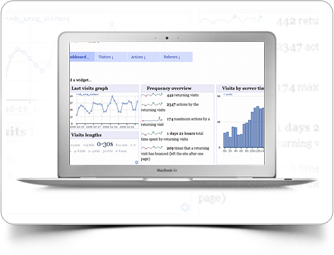 We'll open your eyes to website analysis that's simple to read and easy to act on. No jargon, no confusion, just clear routes to improvement. A month is a long time online so we'll deliver analysis every single month, without fail, helping you to keep a constant eye on performance. We'll interpret the results to let you know what's working and what needs attention and if you want to bounce future ideas off us, that's fine, just pick up the phone. We'll put our seo experience to work making sure your website gets seen and offer tips to create sustainable improvements in your search engine performance. A good website can always get better so we'll help out with testing new concepts or refining campaigns and we'll always have facts to support our suggestions, that's why monitoring is so important to understanding your business. Sometimes the only way to find out is to try. The proof, as they say, is in the pudding, but what would have happened if you'd left things alone? We'll help you introduce new features in a controlled way, letting you see the effect of your changes compared to the control. It's not just your website that needs to be monitored. The best businesses have a watchful eye on competitors too and we can help track their performance or report on campaigns. Not every customer is created equal. Some buy more or stay longer and knowing why and where they come from is a critical ingredient for your business growth. We'll provide full traffic analysis, helping you spot trends and plan activity.